The MAN OF STEEL™ is now on the world’s most secure silver bullion coin. - Premium frosting enhances the engraving on this unique 1 oz Silver Superman Coin. - Radial line patterns behind the S-Shield creates a stunning light diffracting effect, adding yet another dynamic element to these 1 oz Silver Superman Coins. - Security features such as the precision radial line pattern, and the micro engraved textured maple leaf all combine to offer peace of mind to the Silver Superman Coin owner and buyer. - $5 CAD legal tender denomination and one of the highest silver coin face values in the silver bullion coin marketplace. * Multiples of 500 Silver Superman Coins ship in authentic Superman Silver Coin Monster Boxes. ** Multiples of 25 Silver Superman Bullion Coins ship in authentic Superman Silver Coin Tubes. You can choose to buy silver and then elect to store Silver Superman Bullion Coins safely and securely with Kitco Allocated Storage. Kitco offers global options for silver bullion coin storage that are fully segregated, insured and allocated. Kitco Metals' network of top-tier silver vaults include some of the most secure silver storage facilities located in Canada, Hong Kong or the United States (COMEX approved). Cayman Islands silver coin storage is also available (certain conditions apply). Learn more about keeping your silver bullion coin purchases secure, with our Global Precious Metals Storage Solutions. The Royal Canadian Mint is a Canadian crown corporation that mints all of Canada's circulation and legal tender silver bullion coins. Since the RCM released Canada's first domestically produced coin in 1908, the Royal Canadian Mint has achieved a high global reputation for minting excellence. Today, the Royal Canadian Mint's superior technical capabilities allow it to set new benchmarks in silver coin design and quality and make it the producer of choice for many even many foreign country’s official circulation coinage. Kitco is a trusted leader in the silver bullion coin and physical precious metals industry. 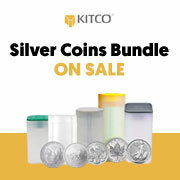 Silver and other precious metals sold by Kitco are recognized in silver bullion markets around the world. With our focus on silver bullion, you can benefit from our low silver prices and premiums that are highly competitive in the industry. We strive to make it easy for you to manage your tangible wealth. You can sell or buy silver and other precious metals using our convenient online store, or by contacting our team of highly trained precious metals specialists. Backed by our global information network, Kitco has proudly been serving our customers since 1977.